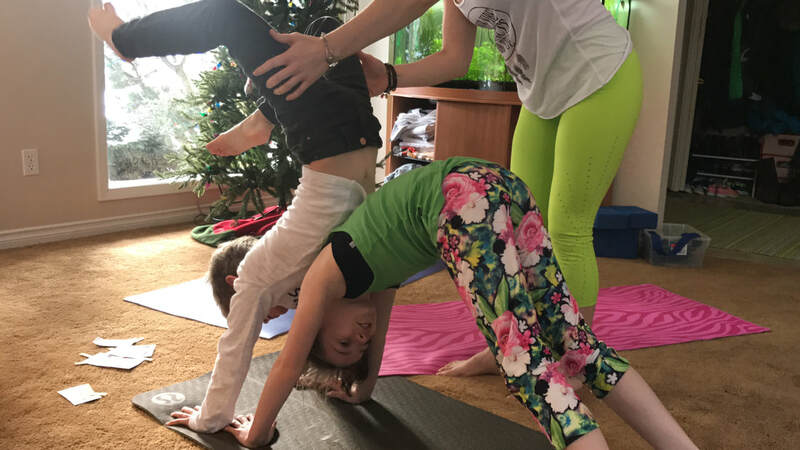 Our private Rainbow style yoga classes are designed to help students from beginning to end, no matter what your experience level is. We customize a program especially for you starting from where you are - that's the beauty of private classes. We begin with a phone consultation to asses your personal or family goals, likes and dislikes, strengths and challenges, and find out more information about how we will best serve your child(ren) or your family. At this time we can also book your initial session, so that we will get to know each other, have fun, and build rapport and trust. Following our first class, a specific and customized plan will be created to meet your needs and desires. All classes will take place in your home or location of choice. Generally, a medium to large size living room, bonus room, or basement with furniture pushed back provides enough space for a family of 4-6 people. To make it even more convenient, we provide all of the mats, equipment, props, and music to create your in home yoga studio! Just imagine the time you'll save and the stress you'll leave behind, not having to pack everyone up, drive over to the studio, unpack yourself, and then do that all over again to go home.... AMAZING! It is a perfect way to buy back your time and create a quality connection with your family OR clean up and make dinner while the kids are practicing yoga. Discounts will be applied to multiple sessions, and we can offer a quote once we understand your needs and goals! Simply fill out a contact form to get the process started. Contact us for more information and to receive a quote on your personalized private yoga program! "It's not how big the house is, but how happy the home is"